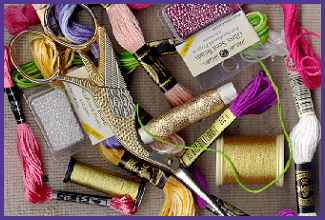 Haberdashery UK for suppliers of threads, fabrics, needles, scissors, lamp stands, magnifiers and other needlework accessories in the UK. In this section, you'll find all the fabrics and notions needed by needleworkers, including appliques, embellishments and motifs, beads, buttons and fasteners, fabric, canvas and cloth, frames, clamps and workstands, lighting and magnifiers, needles and pins, ribbons, braids and lace, scissors, threads and yarns, workboxes and storage, a diary of craft and needlecraft events and a mailing list to keep you up-to-date. We also have sections for Cross Stitch, Embroidery, Knitting and Crochet, Lacemaking and Tatting, Needlepoint and Tapestry, Quilting and Patchwork and Sewing.